Dedicated to Oyan news: “wang” church of Esfehan send’s all the benefits that come’s from holding book exhibitions to Armenia. Based on Oyan News reporters report, the “Wang” church of Esfahan will send all the gains and benefits that comes from selling books in the book exhibition to Armenia. According to this report, in recent weeks, “Wang” church of Esfehan has sold books with subjects of Armenian claims of genocide by holding book exhibition in the museum of this church. This church has announced that all the gains from this exhibition will be sent to Armenia. Moreover, during this exhibition taking photographs and filming were not allowed to visitors. In order to investigate historical and legal background of this subject, Oyan news has discussed it with Azerbaijanis lawyer “Saleh Kamrani” who is living in Sweden now and Pharmacist “Javid Aydin” Secretary of Board of the association of Azerbaijanis living in Eskisehir city of Turkey. “Saleh Kamrani”, the lawyer of Justice Department, has explained the legal aspect of this subject to reporter of Oyan news: related to legal condition of governments assistances to each other, both civil rights and international commitments must be considered. In other words addressing this issues requires investigation of internal rules and regulations including constitution and other existing rules and also investigation of existing rules of international law including bilateral and multilateral contracts, different conventions, UN Security Council’s approvals and International judicial procedure. Kamrani by pointing that, it is not possible to explain all legal details in this brief conversation , added: since Iran is a member of United nations, it needs to meet all its obligations related to neighboring and other countries. These obligations consists of : the principle of good neighborliness, non-interference in the internal affairs of other countries, refusal to resort to force to solve international disputes, respect the prosecutable rights, respecting the principle of neutrality toward belligerent governments and finally adherence to approvals of UN Security Council. This Azerbaijanis activist continued: as you know, Islamic republic of Iran has problems with almost all of the principles mentioned above and also some other rules that we skipped them for brevity. It means that Iran’s actions and behaviors are against international law’s goal of international peace and global realization of international human rights. Saleh Kamrani added: if we want to investigate Iran’s behaviors related to above principles with real examples, we will face with a quite dark workbook which is formed by the violations of fundamental axioms of humanity, racism, terrorism and in a word international rebelliousness. He referred to international rules such as UN charters and Geneva conventions and emphasized : each government has a right of political, economic and military cooperation in the framework of international cooperation with all other countries up to the point that it doesn’t act against the nature of international law’s objective. Non-compliance with regulations governing the war rights is one of the violations. One of the most crucial issues related to the war rights and peaceful settlement of international disputes, is neutrality principle toward belligerent governments as a third country . according to this principle Iran must not support Armenia, financially, military and intelligence relatedly . But during the war, Iran violated this international commitment and supported Armenia in all aspects then caused changes in fate of the war in favor of Armenia. As a result of this assistance 20 percent of territory of Azerbaijan including Karabagh was occupied by Armenia. This Azerbaijanis lawyer said: neutrality principle should be respected till both of belligerent governments are not identified as an aggressor according to UN charter and aggression definition, and recognizing that is United Nations Security Council’s commitment. This council according to 4 resolution has condemned Armenia as an invader and occupier. Therefore in order to adherence to these 4 statement both Iran and all other countries should have supported the implementation of these resolutions based on evacuation of Karabagh and other seven provinces of Azerbaijan by the United Nations Security Council. Saleh Kamrani after emphasizing that Iran has acted in contrary of its international obligations, added: Iran against its commitments not only did not reduces its relationship with Armenia but also does not hesitate any kind of subsidiary ( economics, military, etc.) to Armenia. The relationship between Iran and Armenia not only is in contrary to above mentioned regulations but also is against its civil rights and internal rules such as 11th and 152nd principles of the constitution, that is Islamic Republic of Iran’s foreign policy should be in a way that converge and support benefits of Islamic Countries. Said Matinpour, Qolamreza Amani, Latif Hasani, Ilghar Moazzenzade, Mohammadreza Hadi, Beytollah Mohammadi, Naser Derazshamshir, Saleh Kamrani and some other Azerbaijanis activists have been arrested and then sentenced with judicial harsh sentences with the charge of only having scientific and cultural relationship with Azerbaijan and Turkey citizens. About this issue , Saleh Kamrani told the oyan news’s reporter: Azerbaijanis activists have faced not committed charges and their charges are traveling to Turkish family countries, being interested in Turkish culture and identity. Therefore these could be considered as nothing except anti-Turk and Armenia-favoring policy of Iran’s government. 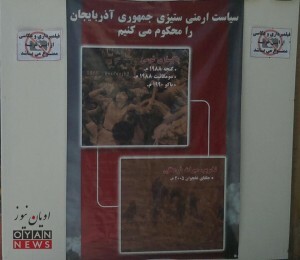 Due to explaining this behavior of judicial system of Iran against Azerbaijanis activists, he emphasized that judicial system of Iran is not independent, related to this claim he mentioned the impact of security agencies on Qolamreza Amani’s case and added: I cannot forget Amani’s interrogation, torture and trail method. One of his charges he sentenced in two years of imprisonment and totally five years of prison based on it was espionage in favor of one foreign country and also in favor of another foreign country in the territory of the Islamic Republic of Iran. The judge even did not bothered himself with mentioning these countries names in the verdict. This charge had not been explained even during his interrogation with inhuman tortures and trial. While in that time he was 24 years old and he did not even have passport to travel to the countries that the court had mentioned. this is the justice of Iranian courts against Azerbaijanis activists. He continued: also Said Matinpour has been sentenced to eight years of imprisonment with this logic exactly like as Amani. This can be considered as nothing except judicial discrimination about Azerbaijanis activists. while the Armenian minority in iran have cultural, political and other rights, and they imply every thing in the streets( demonstrations) which they do against Azerbaijan and Turkish people. Even they freely have cultural, political and economic relation with their mother country Armenia. Because of being Turk, Azerbaijan has been kept hostage both by Iran and Russia in south and north. Saleh Kamrani lawyer of justice department later continued by mentioning Armenia’s Condemnation in international communities, during the 4 resolutions issued by security council of united nations from 30 of April to 12-th of November 1993 by numbers 822, 853, 874, 884 has been recognized as the invader and occupier country. He stated that: according to these 4 resolutions Armenia and other Militants of karabagh of Azerbaijan had to evacuate all the invaded lands of Azerbaijan. In numerous paragraphs of this resolution it has been clearly stated that karabagh belongs to Azerbaijan .and all the countries specially the neighbor countries has been warned not to do any hostile action that could endanger the ceasefire between two sides. 1- Biased operation of countries supporting Armenia above all Russia and France in MINSK group of Organization for Cooperation and Security of Europe, which according to these 4 resolutions must be in fact executive and supervisor characters. 2- Failure of Republic of Azerbaijan in using its national facilities for freeing the occupied lands. 3- above all strong supporting of Iran and Russia from Armenia in occupying the lands of Azerbaijan , which each have their own reasons for this inhuman policy and against national rights decision. In explanation of Iran’s reasons we should consider anti-Turk policies in all Iran and sense of sameness between these policy makers and Armenia. And concerns about the national movements for rights in south Azerbaijan is another reason for this . This Azerbaijanis lawyer added : because of inflexibility of policies in Iran about personal and national rights of Azerbaijanis applying, the only way left is Violent suppression in south Azerbaijan and interfering in internal matters of north Azerbaijan which could vary from terrorist actions to drugs smuggling or supporting Religious extremism or supporting the invadors.in fact it can be said that because of being Turk, Azerbaijan has been kept hostage both by Iran and Russia in south and north . He claimed that, the final goal of Iran is to take the dominance in strategic point of Caucasus and therefore win over turkey and Russia . Saleh Kamrani in the interview with the Oyan News Reporter mentioned the demonstrations of Maraghe’s people a few days ago, and said : demonstrations of national activists of Azerbaijan are completely legal and an important part of their basic freedoms and rights. In other words this is the premium right of personal and public rights of any citizen of south Azerbaijan to object to any policies from the regime that are against civil law or international agreements. Because Iran with violating the principle of neutrality between Azerbaijan and Armenia in the beginning of the war , and afterwards with supporting the invader Armenia after 4 resolutions of security council of united nations, has actually co-operated in the invasion. He continued that Azerbaijan’s people has been sensitive against the policy of interfering of Iran from the beginning of the invasion of the Karabagh, and has protested its policies in favor of Armenia severally in important times. demonstrations of students of universities of Tabriz and Tehran and … , and demonstrations in front of embassy of Armenia and other places shows the displeasure of Azerbaijanis from these policies of Iran. Kamrani praised this action of Azerbaijanis activists and stated: this demonstrations which led to arresting Azimi Qadim and Davoud Azimzadeh is in fact continuing the right pass, that was started before by activists like Amani in front of Armenian Embassy. He pointed out that Condemnation of activists like Azimi Qadim to imprisonment shows the misusing of Islamic values by Iranian government. We can’t forget that these so called claimers of Islam , once only for receiving the satisfaction of Armenia’s minister of agriculture, bitted up national activist Abbas Lesani in front of Sarcheshme Mousqe of Ardabil. He thinks that these demonstrations must continue stronger and more often against the invasion policy and betraying and interfering policies of Iran. The asseveration of “ethnic cleansing of Armenian’s” in Azerbaijan republic , the fake claim of “ Armenian’s Genocide “ this time against the republic of Azerbaijan. In the banners of this exhibition it was claimed that in the years 1988 and 1990 in some cities of republic of Azerbaijan “ethnic cleansing of Armenian’s” has been applied against the Armenian residents of these cities. About this issue Pharmacist doctor Javid Aydin and secretary of the board of Azerbaijanis of “ Eskishehir “ in the interview with the reporter of oyan news, about the events of those years says : some conflicts happened between the Azerbaijanies and Armenian’s of some cities of republic of Azerbaijan, which as a base led to the karabagh War some years later. Everything started from the death of two young persons in a village near Asgaran. After this event, Armenian’s with this excuse marched to Qazaq villages which were kilometers far from the place of this event. During these attacks village houses of “ Ashagi salahli “ and “ yukhari salahli “ was burned in night and some people were killed. This pharmacist doctor continues that, whilst these events were happening something else also occurred, which Armenian’s called it later “Dismissal of Armenian’s from Ganje “. But the truth was that actually Azarbaijanies of Iravan and Armenian’s of Baku and Ganje and Sumqayit, had started exchanging houses. This was not forced by governments , but by the request and satisfaction of the citizen’s of both countries. The secretary of the board of Azerbaijanis of “ Eskishehir “ and mentioned the role of KGB path in the upcoming events, and preparations for the existence of red Army in Azerbaijan and said : maximum conflicts happened in Sumqayit city and 20 to 21 Armenian’s died. After this event red army with the excuse of preventing more conflicts in the region entered Azerbaijan. And then happened the black and murderous events of January. This Azarbaijanies citizen insist’s on the role and guidence of security forces by KGB in these events and says : according to documents of the court ( this court was set few years later, and subjects of these genocides were trialled in it ) a persone called Edward Gregurian confessed that had killed 7 people himself, according to these proofs , murderer’s of Armenian’s in Sumqayit were armenian groups which with the guidance and plan of the security forces of russia, were seeking to increase the anti Azarbaijanies feelings , and were trying to use it to Tarnish Azarbaijan’s independence, and prepare the baises for invading the Karabagh. The Notable point in these murders was that according to the statements of witnesses the victims were all people who had refused to pay the Annual grants to Armenian churches or had not supported the racism of Armenian’s. He analyzes that presenting such claims by the Armenian’s around the world, prepares the basis for the repeating of the fake claim of “ Armenian’s Genocide” this time against the republic of Azerbaijan .”Wang church” or “Amena perkij “ is the name of the church in Jolfa district of Isfahan that has been copied after the saint Estepanus church in Jolfa city in Azerbaijan. This church is located in Hakim Nezami square, Nazare SHargi street and in Alfred Alley. Using this news is only permitted by mentioning the source, Oyan News.